Israeli forces, Friday, quelled the weekly and peaceful anti-settlement demonstration in the village of Kufr Qaddoum, to the east of Qalqilia, according to a local activist. 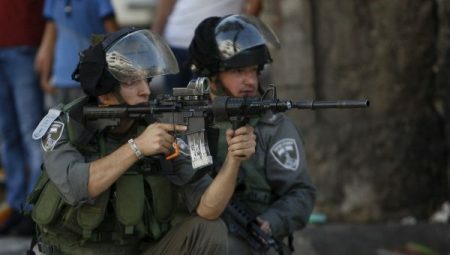 Coordinator of the popular resistance committee in the village of Kufr Qaddoum, Murab Shtawi, said Israeli forces used force to suppress demonstrators, who also rallied to protest Israel’s closure of the main road that connects the village of Kufr Qaddoum with the city of Nablus since 2003. Forces used rubber-coated steel bullets, and tear gas canisters against demonstrators, who responded by burning tires and throwing rocks at the soldiers. No injuries or arrests were reported by WAFA. The only alternative road is roughly six times longer than the previous route, disrupting the villagers’ ability to attend university, their jobs, and other vital aspects of their economic and social wellbeing, noted Addameer. “Three Palestinian deaths relating to the road’s closure occurred between 2004 and 2005,” it said. Although Kufr Qaddoum’s Popular Resistance Committee took their case to the Israeli High Court in 2003, the legal status of the road remains unchanged, stressed Addameer. After all legal appeals failed, villagers decided to organize weekly demonstrations in July 2011, a step that was met with violent suppression by Israeli forces.